As I was writing our previous blog post about the B/A/D Talks event where we explored the idea of Narrative Architecture, I thought of our video, Kitchens. Narrative plays a leading role in design at KR+H. This can be seen on our Kitchens video where Paul Reidt expresses his thoughts on how he approaches design. "I think maybe the best measure of whether a kitchen is successful or not is whether you've created a setting for people's lives that supports those lives. It's the place where memories are created. It will serve as a setting for so many human experiences; and I especially think of this when there are young children, wondering whether they're going to bring images of this place into their future." "Many times our customers come to us with images of things that are appealing to them. [...] And it's important for us to know why these things are appealing. I always want to hear the story that they have to tell." Images from KR+H's video, Kitchens. We hope you'll take a short three minutes to see our Kitchens video. You'll meet Paul and travel through images of kitchens designed by us and other design professionals who share our interest in narrative in design. You can view the video below. Enjoy! In KR+H's video, The Shop, Paul (Reidt) says, "Walking through the shop is a fabulous experience because there are projects in different stages of accomplishment." The stages of process, from design through installation, are valued at KR+H, and it is evident in our shop as you see hands and minds and tools work in artful unison. Whether the project is a custom kitchen, furniture, or millwork, we feel our joy in the making of things plays an important role in our customers delight and engagement in their projects. The Shop is a three-minute look inside that we hope you enjoy! If you would like to come see our shop in person, please give us a call at 781.573.1500 to schedule a time! "Design a free standing dwelling for an architect. Must support the following activities: cooking, dining, sleeping, bathing, socializing, and studying/drafting. Size: single story, no larger than 100 square feet. Smaller is better." This was one of my earliest studio assignments in architecture school. I was already a cabinetmaker when I started school so my solution to this challenge was more like a multifunctional cabinet composition than a house. I fit the whole program into 60 square feet and got the prize for size. My dwelling cabinet had parts that slid, dropped, folded, and flipped to transform the tiny space from one function to another. It was complicated, but uncrowded, and the intricacy of the parts made it seem richer than expected for such a tiny house. I liked the notion that a small and seemingly simple object could unfold to support a large variety of functions...like a Swiss Army knife, or an iPhone. Today, economic and environmental forces provide an incentive to build homes that are smaller in size, and consumers are looking for the presence of detail and character. My student exercise from 30 years ago has changed from pedagogical device to something directly relevant to a real world model for housing. Smaller homes require that spaces be multifunctional and flexible, just like my dwelling cabinet. 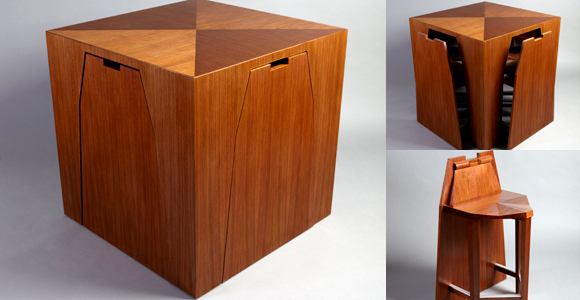 At KR+H, we recently built a cabinet assembly inspired by these considerations. It contains all of the storage and equipment requirements of a fully functional kitchen, but can transform from workplace to gathering and dining space as parts fold, flip, and slide. Like a Murphy bed, its primary function can withdraw to support other activities in the same space. We designed our Hidden Kitchen for dwellings like lofts or studios where one space needs to accommodate a broad range of activities. When we exhibited our Hidden Kitchen at the ICFF in New York, one architect who designs office environments thought the unit would do well in offices where it is becoming more common to have meetings or conferences accompanied by the preparation and serving of food. Another attendee has hired us to produce a hidden kitchen in the front parlor of his townhouse. We are working on a design that refers to his collection of Art Deco furniture which will occupy the same room. KR+H's Hidden Kitchen is made from quarter sawn American black walnut; back-painted, acid-etched glass; and stainless steel. Appliances are by Sub Zero, Miele, and Fisher Paykel. The unique, articulated tube design of the faucet (Karbon model by Kohler) made it possible to tuck the faucet into the sink and keep it out of sight when not in use.